Due to thermal activity electrons accumulate within the diode array over time that time. The dark current noise contribution should be known through measurement over a given exposure time and reduced by subtraction from the real signal. A compact filter wheel is integrated into the BTS2048-VL for the dark current measurement and compensation and to extend the dynamic measurement range. The wheel can be set to either of four positions: open, closed, Filter OD1 and Filter OD2. The Optical Density Filters expand the measurement range by a factor of ten or one hundred. The BTS2048-VL optimizes the Signal to Noise Ratio by choosing either the premeasured or dynamic dark signal mode. By doing a premeasurement of the dark signal, the results are used during all following measurements without any additional loss of time (see diagram bottom line). 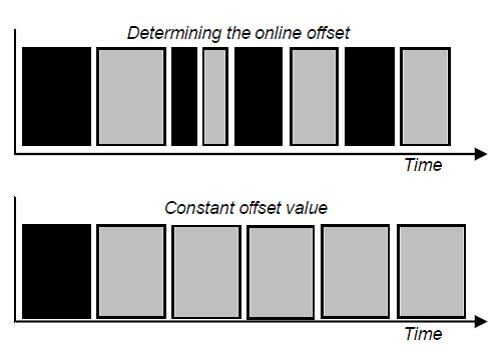 If the integration time changes the offset must be measured again. Setting a static or constant offset helps shorten measurement response time When dynamic is selected the dark signal is measured every time a measurement is made employing precisely that same integration time (see diagram top line). As a third option, the dark current subtraction can be disabled.